Do not do the beach excursion - go to the free pool when you leave the ship. Water was rough. Beach was nice-had free WIFI. Food and drink was included and was ok.
Beach and Maragritaville are rught off the ship. Loved the food, pool, scenery, shopping, restrooms were large and clean. Loved the food, pool, scenery, shopping, restrooms were large and clean. I especially enjoyed the music around the pool area. Expensive but the private beach was nice. Expensive but the private beach was nice. Salem was a great bartender. The drinks and food that were included were great! Island Vibes- nice tour, beach had rocks, drop offs, strong undertow, no amenities. Went to a persons beach home . Went to a persons beach home . Very nice people ! Beach was okay but not compared to Half Moon Cay for free. Bajari Beach Club staff are amazing. Bajari Beach Club staff are amazing. Fun time, kiddos enjoyed! Excursion – 9.8/10 – All-inclusive beach break ($80 per person, 5.0 hours Duration). Home Sweet Home Excursion was amazing! Home Sweet Home Excursion was amazing! Beautiful, clean, friendly staff there. Great time! The beach was nice and the water was very clear. The beach was nice and the water was very clear. The people running the private beach were friendly. Went snorkeling for the first time and really enjoyed it. It was a rainy, misty day...so we stayed awhile then back to ship. Home Sweet Home - quiet beach, great food and drink. We took the All Inclusive Beach excursion (with toys). A lot of rocks in the water at the beach , the food was ok not that good. Rocky beach. Bring your water shoes!! Good snorkeling. Food was pretty tasty, Rum drinks were awful but the local beer is pretty good. As with so many Carnival excursions it was overpriced and underwhelming. We booked Home Sweet Home through Carnival. 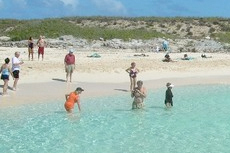 We swam at the Carnival Cruise Port - this was the most organized area of Grand Turk. We swam at the Carnival Cruise Port - this was the most organized area of Grand Turk. Very clean. We did the Home Sweet Home beach break.